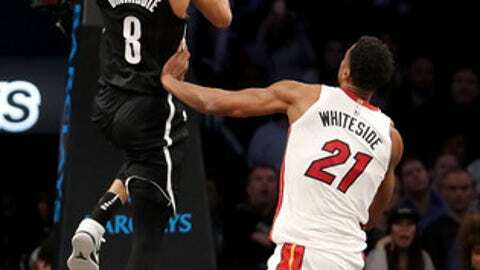 NEW YORK (AP) Down by 16 points early in the second half against the Heat, the Nets dug in on defense. DeMarre Carroll tied a career-high with 26 points, Spencer Dinwiddie had 15 and the Brooklyn beat Miami 101-95 on Friday night. Brooklyn snapped a five-game losing skid at Barclays Center and a seven-game home losing streak to the Heat. The Nets also improved to 11-1 when holding opponents under 100 points this season. The Heat led 64-48 with 8:53 left in the third quarter but scored just five points the rest of the period as Brooklyn closed to within two. Whiteside had 21 points and 13 rebounds, and Goran Dragic scored 17 points for the Heat. ”I thought Caris and Quincy (Acy) came in the game and changed the energy,” Nets coach Kenny Atkinson said. Heat: Coach Erik Spoelstra praised Dragic before the game. ”He means everything to our team. In our eyes, he’s having an All-Star season. There’s a reason why we are where we are in the East, and he’s a big part of it.” … Isaiah Whitehead (G-League assignment) and Jeremy Lin (ruptured patella tendon) were out for Brooklyn. Nets: Atkinson said Russell will play in short stints as he works his way back from left knee surgery. … Tyler Johnson (left ankle), Dion Waiters (left ankle), Okaro White (left foot) and Rodney McGruder (left tibia) were out for Miami.